DUNNES STORES HAS increased its sales by the greatest share of any of the ‘big three’ supermarket chains while locked in a bitter industrial dispute with staff. Despite the negative publicity the Irish grocer has attracted during the strike action, the value of its grocery sales went up over 4% between early March and late May compared to the same period in 2014. In contrast, SuperValu sales were up only 1.2% and Tesco’s grocery turnover went down 3% over the 12 weeks, according to the latest figures from Kantar Worldpanel Ireland. The analysts noted it was Dunnes’ sixth-straight month of growth, with shoppers both buying more items and spending an average €3.40 more per shop for the latest period. It came in spite of national strikes among workers protesting zero-hour contacts and the company’s refusal to deal with unions. There was also widespread condemnation for the firm after reports of apparent reprisal sackings in the wake of the industrial action, which is ongoing. Elsewhere, Tesco regained top spot in the market after SuperValu drew level with the long-standing sales leader in a survey earlier this year. Kantar’s Georgieann Harrington said the UK grocery giant had managed to get more customers to shop in its stores, although its share of the market was still well down on its placing a year ago. Tesco has reclaimed the top-spot capturing 25.2% of the grocery market, but the retailer is still seeing sales decline as their performance remains behind the market,” she said. Tesco, which has struggled over the past year amid falling revenues and a major financial scandal, recently scrapped its annual bonus for thousands of Irish staff because of the poor performance of its local wing. 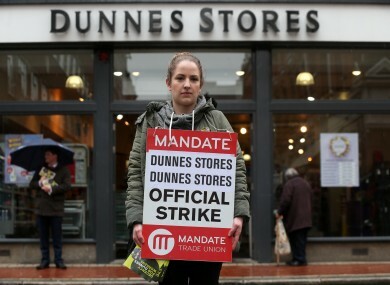 Email “The Dunnes Stores strikes aren't making a dent in its sales”. Feedback on “The Dunnes Stores strikes aren't making a dent in its sales”.